This clean, uncluttered design for a young couple’s condominium showcases rich wood floors, light and dark marbles, and contemporary accents in glass and metals. The millwork design for the kitchen features bright white cabinetry with unique storage options and a combination of white and walnut materials. Classical sculptural furniture in monochromatic tones with pops of color create a livable “soft contemporary” space. A sophisticated urban apartment plays light and dark neutrals together, offering contrast with subtle color. Soft upholstered pieces and solid squared shapes for tables and cabinets offer comfort with a bold statement. Texture is key to this design—not only in the fabrics and wood finishes, but in the cut stone, mirrored and steel light fixtures and decorative accents. This is definitely urban sophistication at its finest! Shape and form create interest in this studio apartment. 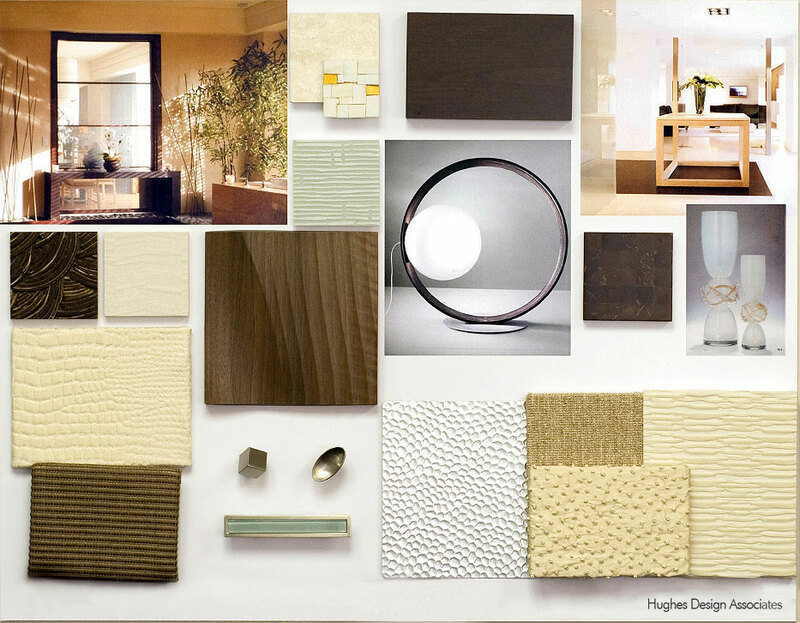 Rich woods, mosaic tiles, cut stone, metal accents and glass add texture and interest. New materials such as moulded synthetics are used for special features. Lamps and lighting fixtures glow with curved shapes to soften the sleek wood furnishings. Every fabric has a unique weave and soft touch. In a smaller space, it is more important than ever that each element be perfect in its contribution to the overall design. 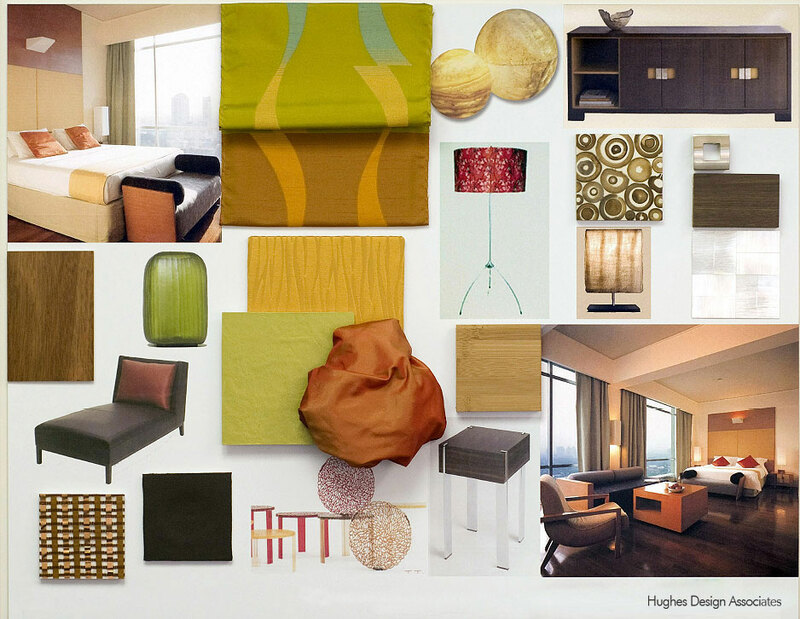 Sleek, fun and colorful are the key notes to this tower condominium. Unusual and playful accent pieces add to the artistic feeling of this creative person’s aerie in the sky. Fabrics are shot with color, lamps have shades like artist’s canvases, and clean-lined and strong furniture pieces hold the design together. Embossed resin materials are used for millwork and furniture details, and bright metals add sparkle. What a fun place to live! Soft and neutral, calm and serene, and outlandishly comfortable, are words to perfectly describe this elegant, contemporary bedroom. 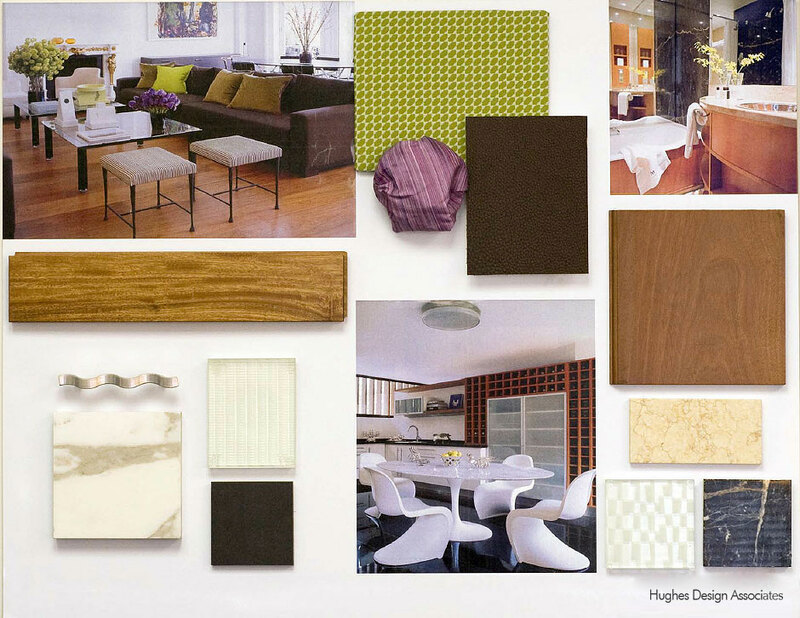 Mosaic stones, metal leaf finishes on case goods, rich millwork, and brushed metals all add interest to this design. Each fabric is selected not only for its color palette, but for its distinctive weave. Sleek leather adds a different feel and look. 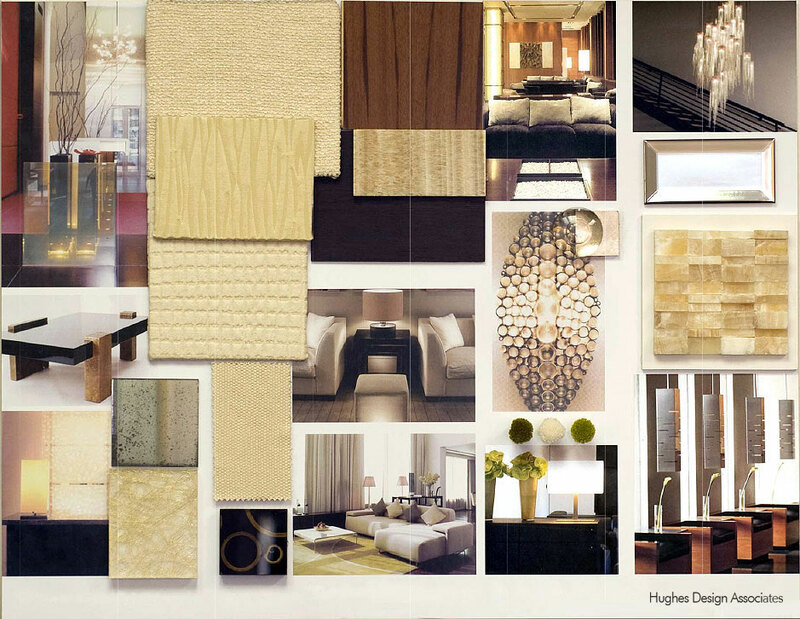 Soft lighting, as sconces, floor lamps and table lamps, gives a glow within this special room. A bright palette of reds, oranges, and greens sets the tone for this ethereal waterfront home design. Open spaces and white walls lend themselves to an eclectic, global, and tactile amalgamation of materials. Bamboo and stacked stone surfaces, grass covered walls, sisal rugs, striking light fixtures and curvaceous pottery blend together to create a diverse textural and tonal mix. Clean, smooth lines on both the case pieces and seating intensify the contemporary and modern styling of this home. This residence incites the ultimate “wow” experience. Dining while on vacation has never been more relaxing and carefree as in this stunning design for an island resort. 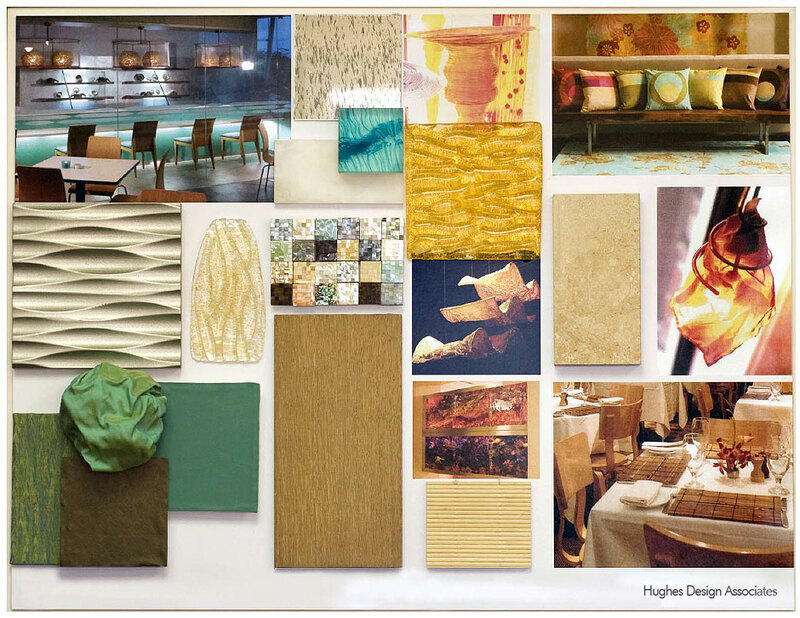 Color is everywhere: textiles, mother of pearl mosaics, light fixtures and art. Shine is subtle but interesting, adding a special glow to soft evening light. 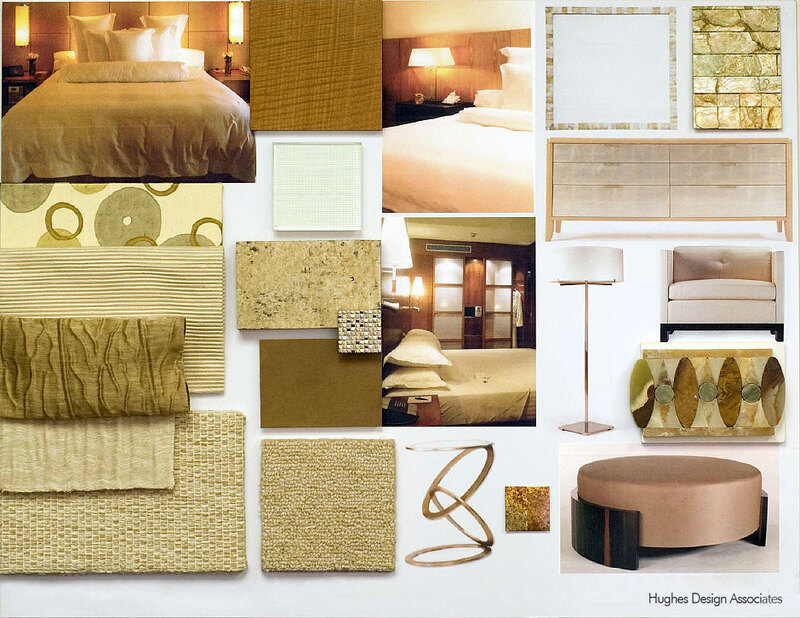 Materials and lamps are distinctively textured, and reference shapes found in nature: waves, clouds, and fire. Everything is soft, gracious and unexpected. This very contemporary space is warm and welcoming, evoking feelings of calm and serenity. Everywhere the eye falls, there is something special to see. Most spas found in history flourished because of the healing powers of hot springs and mineral waters. Water continues to be the core element in today’s spa and is the primary focus in spa interior design. For this particular spa, overlooking water outside and in, textural materials were used to enhance the feeling of being with nature. Compressed bamboo is hung as wall accents and floors are made of bamboo as well. Other natural woods are contrasted with glazed mosaic tiles. Stone countertops look as if they were dredged from the bottom of the ocean, and innovative materials inspired by nature, such as leaves and sea grass, are embedded in resin. Large windows, glass ceilings and open space plans diffuse the pristine and unadulterated light. 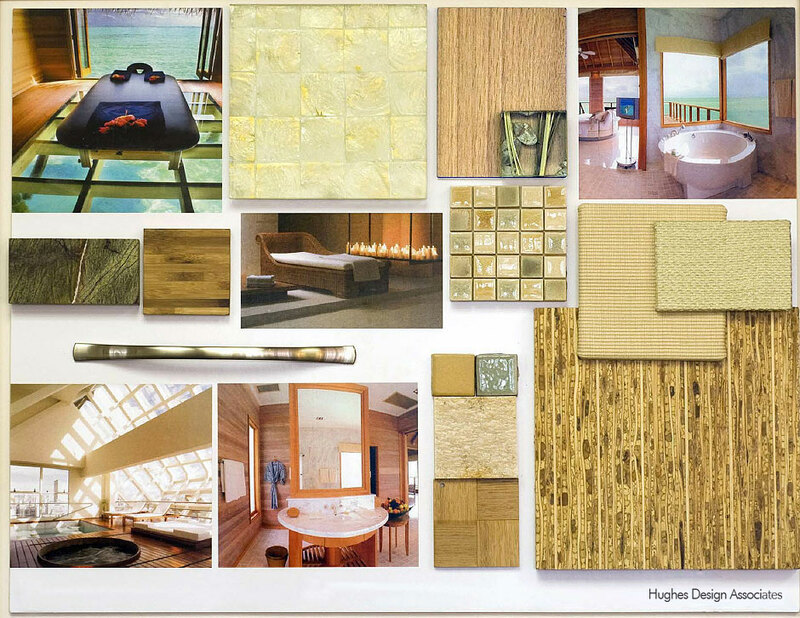 This spa design truly restores and pampers the body, mind, and soul. What fun! A house on the beach! This is a home truly meant for entertaining and pleasure. To achieve this “one with the beach” consciousness, the exterior played as strong a role in design concept as the interior, if not more. The pool, with its clean lines and contemporary style, is a main focal point, accompanied by comfortable lounge seating, chaises and space for dining. Comfort and durability are important objectives in designing this space. The bar is exotic and exuberant, with spheres of light and sculptural stools. 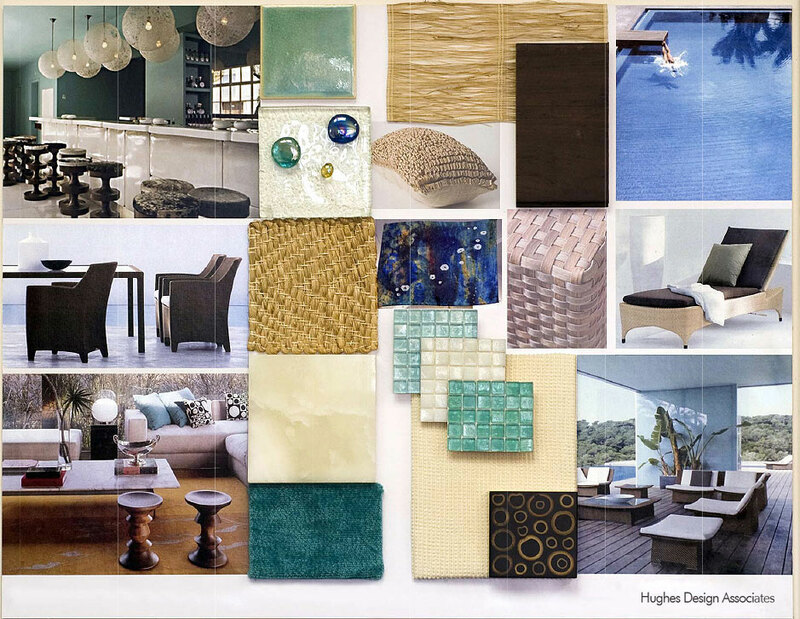 Texture is a key underlying element of the various materials that are utilized: sisal, mother of pearl, sea grass, woven rattan, shapely carved wood, and glazed and polished mosaics. This beach house exemplifies friendship, relaxation, good food and beautiful surroundings. 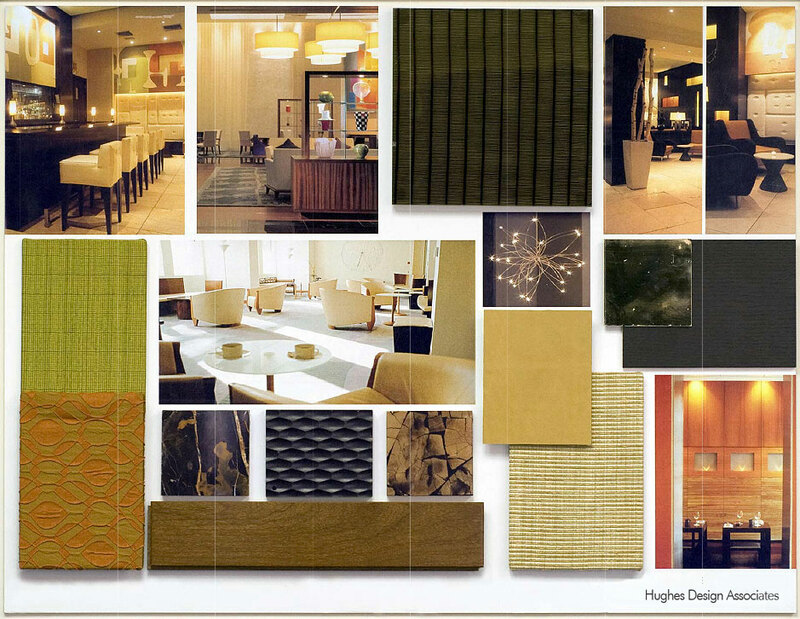 Sleek, clean, urban and contemporary are words that describe this very sophisticated hotel lounge design. Dark and exotic woods, textured patterns set in resin, floating light fixtures and streamlined seating come together to create this high style and stimulating space. Proper lighting that highlights the glossy bar, abstract art and figured and stylized millwork add to this enticing atmosphere. 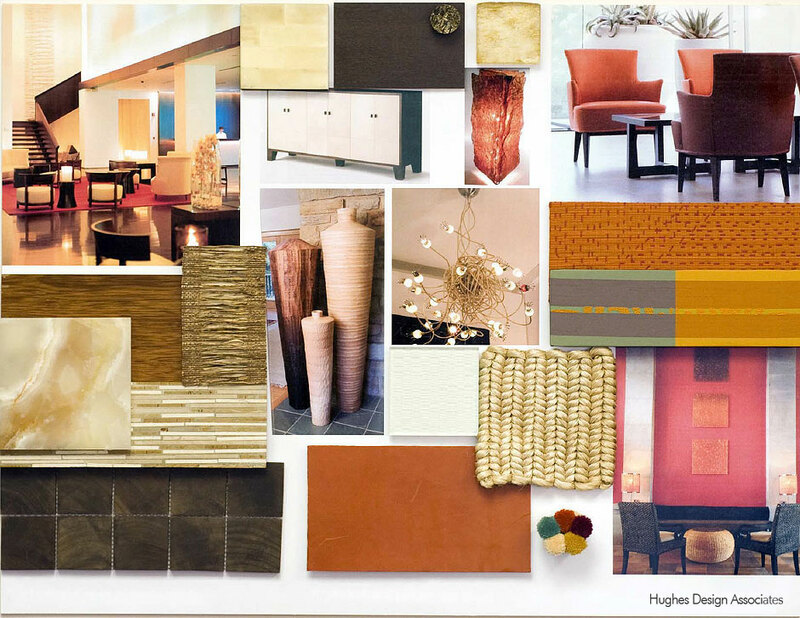 Neutral colors, complemented with bright accents of orange and rust textiles, provide a stunning juxtaposition with the dark wood. Turning the corner, one finds a quieter, calmer area where natural light spreads through a space of pristine white floors and creamy upholstery. This project is thoroughly an exciting study in contrasts.